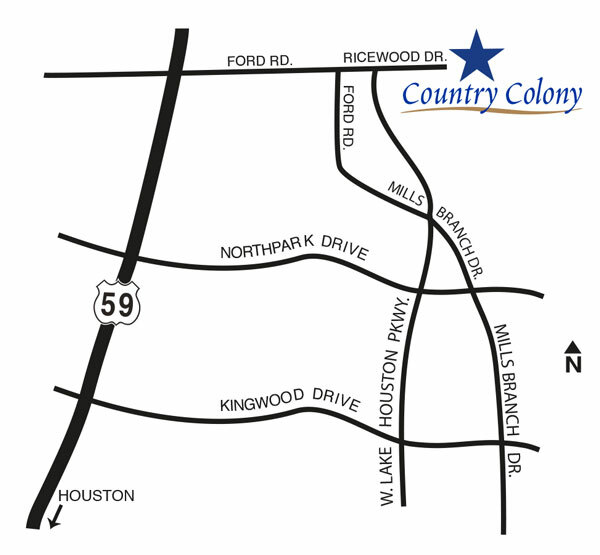 Please join us for a complimentary continuing education course in Country Colony sponsored by Friendswood Development Company. Enjoy a light breakfast and lunch on us and earn 4 hours of TREC CE credit. From Hwy. 59 North: Take Hwy 59 North. Take the Northpark Exit; head east on Northpark Dr. Left on W. Lake Houston Pkwy, continue as road becomes N. Lake Houston Dr. Right on Ricewood Drive. Left on Northwood Mill Road, into the community.